Easy breezy skewers that everyone will love! Just start with Hoffy Bacon Wrapped Hot Dogs, add a few favorites and you’ve got it. Meanwhile for skewers. 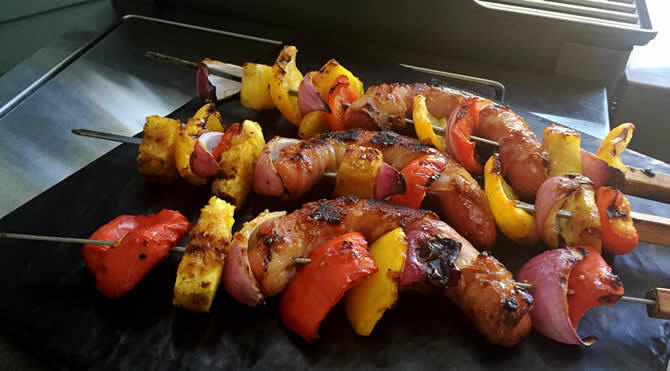 Alternate 1 chunk of each pepper, a pineapple chunk and onion wedge, then skewer bacon wrapped hot dog making sure to skewer the bacon as well as the hot dog. Repeat the veggies pattern and then skewer the other end of your hot dog, again making sure to catch the bacon with the hot dog, repeat vegetable pattern once more. Grill over low heat with lid down turning every couple of minutes for about or 8 minutes, or until bacon crisps and veggies looked cooked through. For last two minutes on each side, baste with teriyaki sauce.